OMG, Was George Orwell Right? I have been taking more of an interest on the media’s manipulation of the masses just lately and I’m horrified at what I see, I knew it was bad but I had no idea it was as far reaching as it is. It came to light more so today when one of my Twitter followers tweeted that ‘The Chinese Communist Leaders should not be trusted’, well, I’m obviously not going to comment on that one due to where I live, however I did reply to that statement simply saying ‘Politicians and politics in any country should not be trusted’! and please stop blaming one country for the problems in our world! We must, if we want to see change happen and see a possible way towards world peace; start working together as one race, and not in a competition against each other for supremacy and power. We must find a way to form media outlets that speak for humanity not on behalf of the powerful global corporations, the rich, the famous or on behalf of one country over another. http://www.alternet.org/tea-party-and-right/6-totally-bonkers-right-wing-utterances-week-world-cup-evil-obama-plot the link says it all ! http://www.alternet.org/drugs/why-are-government-and-big-pharma-ignoring-heroin-addiction-vaccine , yes, what are they ignoring it? There is a movement globally towards world peace, we just need to start listening to the right channels to find out more and stop watching and reading the media that is trying very successfully to control our lives. The media making money, that’s how they do it and money is all they care about, they destroy people, communities and countries with their untruths, cause political and religious wars through their lies and deceit! All in the name of power! Power for the few at the expense of the many! 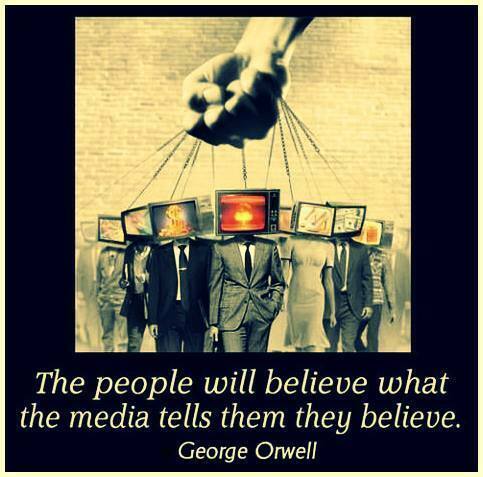 I have stepped away from watching the news for years, knowing it is only brainwashing of the worst kind. The other day I had a doc appt. and in the waiting room there was a huge plasma TV blaring out death. I frantically looked around to find someplace away from this death and so I sat in the children’s playroom. It is horrifying what I am seeing as a result of the media.